This is the list of the Top 10 Radio Stations in Bangladesh with contact details. These radio stations are Bangladesh government approved. Now-a-days most of the people, especially young people are using mostly Smartphones for their various purposes. With the technological advantages, most of the Smartphones have radio app to listen radio channels based on the local community. The scenery of Bangladesh is similar to other countries of the world. There are so many radio stations for its huge demand from the young people. There are plenty of radio stations in Bangladesh. Most of them are private and created then with own investment. It’s an important media in Bangladesh as it’s easy to access, especially in the smaller communities in the country. Moreover, many of them are broadcasting online via internet. They offer daily news, popular songs, sports, drama and much more interesting topics on public demands. Some of the top ranked FM radio channels, including Radio Furti, ABC Radio, Radio Today, Radio Aamar, Radio Shadhin, Dhaka FM etc. There are some community radio stations in Bangladesh, including Sundarban 98.8 (Khulna), Bikrampur 99.2 (Munshiganj), Mukti 99.2 (Bogra), Naf 99.2 (Cox's Bazar), Padma 99.2 Rajshahi etc. 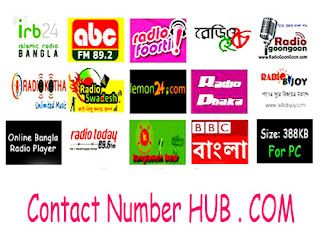 Online Radio Stations: Bangla Radio 24, Radio Health, Radio Jibon, Radio 2fun, Radio Boss24, Radio Alibaba, Radio Mrittika, Radio Metro, Grameen radio, FM, Radio Lolipop etc.